Twitter is an awesome tool to interact and share quickly. Porting this concept and urge to share favorite torrents, here comes TorrentTwitter. 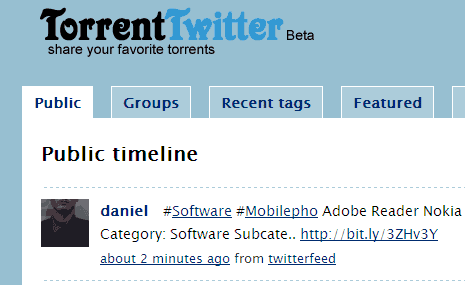 It is a Twitter web tool for sharing favorite torrents (not affiliated to original Twitter.com). To get started, register free account or sign-in using Open ID and start sharing torrent links within confines of 140 characters. Homepage show latest activity with hottest torrents available for quick download. You can also dig into more content by browsing tags, features and popular section. Users can also form group for sharing like minded torrent content. It also provide option to subscribe RSS feed and enjoy updates in your RSS reader. Bump into TorrentTwitter before someone bumps its off accusing it of promoting illegal content (same old story! ).